Welcome to the home of Appalachian Fly Guides. 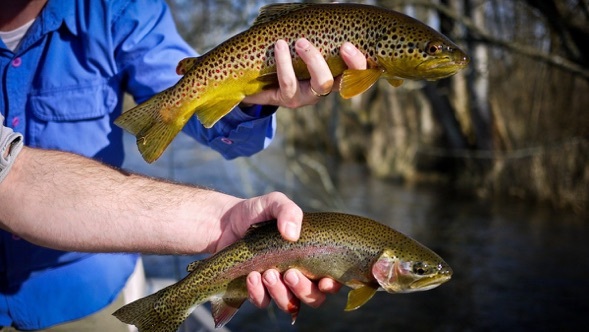 We are a licensed and insured fly fishing guide service located near Boone, NC. We specialize in guided float trips for trout and bass in Western North Carolina and Southwest Virginia. Our home water is the Catawba River Tailrace below Lake James located near Morganton, NC. We are some of the most knowledgable and experienced guides on the Catawba Tailrace. We spend November through May focused on Catawba river and May through October focused on New River Smallmouth Bass! Of course we venture over to the famed Watauga and South Holston, but we prefer to avoid the crowds. If you want to fish E. Tennessee all you have to do is ask! If you find yourself in western North Carolina call or text 828-446-5552 or email appflyguides@yahoo.com to book a trip!